FOIMan completes his exploration of the EIRs with an article on the reasons why requests for environmental information can be refused. Just as with FOIA, requests for environmental information held by public authorities can be refused in specified circumstances. For the last few issues of PDP’s Freedom of Information Journal, I have been writing about the EIRs, and in the last of the series (available here) I look at the exceptions that can be used to justify withholding environmental information. I’ve brought all three articles together to form a Guide to the Environmental Information Regulations so that you can easily access them at any time. This can be found in the drop down list under the ‘Free Resources’ section of the FOIMan site. All my PDP articles can also be found there on the ‘Articles’ page. FOIMan examines the similarities and differences between FOIA and the Environmental Information Regulations. A few months ago I started a series in PDP’s Freedom of Information Journal on the Environmental Information Regulations (EIRs), starting with an examination of the definition of environmental information. Here I bring you the second instalment in the series which looks at how FOIA and the EIRs differ. I’ve just written the third and final part in the series which covers the exceptions in the EIRs. You’ll be able to read that in the next issue of the journal or right here on the FOIMan site later in the summer. Once they’re all available, I’ll put them all in one place in the Resources section so they will act as a comprehensive guide to the EIRs. FOIMan explains why the ruling of the Supreme Court in relation to Prince Charles’ “black spider memos” is so significant – and why FOI campaigners should be cautious in their celebrations. 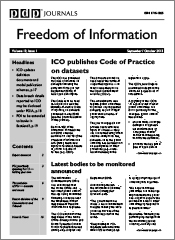 On 1 January 2005, FOI came into force. Later that same year, the Guardian’s Rob Evans made Freedom of Information requests to government departments for correspondence with Prince Charles, the heir to the throne. Ten years later, the Supreme Court has finally ruled that those letters (or many of them at least) must be disclosed. The full story of those ten years – together with many of the key court decisions – can be read in Matt Burgess’s excellent piece on the FOI Directory site. This ruling is important – and for me, pleasantly surprising. After the Court of Appeal considered this case last year, I gave my analysis on this blog, and it turns out I was wrong. Though not entirely. My prediction was that the Supreme Court would rule that the veto was legitimate in relation to information subject to FOI, but that the European law that underpins the Environmental Information Regulations (EIR) would lead to a ruling that the veto cannot apply to environmental information. As it turns out, the Court ruled that the veto was not legitimate in either case, though there was more support from the Justices for the veto not applying to EIR (6:1 as opposed to a 5:2 ruling on the use of the veto in relation to FOI). Huge congratulations are due to Rob Evans and the Guardian. Rob and the Guardian have been persistent in pursuing the release of the letters, even when all around (or many of us) were sceptical of their success. But I now want to consider the implications of this judgment for FOI and EIR. Firstly, what does this mean in terms of the release of correspondence between members of the Royal Family and public bodies? One of the reasons that this case is so important is that it is now pretty much the last chance any of us will get to see what is said in correspondence like this, unless it is leaked (or relates to environmental matters – see below). This is because FOI was amended in 2010 – during the wash-up of the last government – to make the exemption covering relations with the monarch and their two nearest heirs absolute. This means that the government and other public bodies will be able to refuse all future requests for correspondence with Prince Charles under FOI. This ruling will not change that. But at the time of Rob Evans’ request, the exemption was subject to a public interest test, and that is how we have reached this point. If the correspondence is released, then that will be the last FOI disclosure of Prince Charles’ letters. That said, the ruling is significant in terms of environmental information. Given the Prince’s known interest in environmental matters, it is likely that public bodies will hold many letters from the heir that would fall under the EIR. All the exceptions (the EIR equivalent of exemptions) under EIR are subject to a public interest test, and this judgment makes clear that Ministers cannot exercise the veto in relation to any decision to disclose information falling under EIR. So we may well see future disclosures of correspondence from Prince Charles relating to environmental issues. But in many ways, the most important implication of this ruling has nothing to do with the Royal Family. The point of this appeal was to consider whether the Attorney General was entitled to exercise the controversial veto at section 53 of FOI. And the judgment says some pretty important things about the veto. So the effect of this ruling is to call into question almost all use of the veto, certainly up to this point, and potentially in the future. This is a huge defeat for the government. Without wanting to pour cold water on well-deserved celebrations, that is exactly the reason why I think we need to be cautious. Governments don’t like huge defeats. And the veto has been used by both the last two governments. David Cameron has already released a statement saying that the law will need to be amended to reinforce the veto and make its future use clear and unassailable. Speaking at 11KBW’s Information Law Conference last week, barrister Tim Pitt-Payne, who has represented the Commissioner as well as government departments in FOI cases, expressed his view that if this ruling went against the government, it was likely to reopen the question of the application of the section 35 exemption for policy formulation. When the Justice Select Committee examined FOI three years ago, it decided that section 35 didn’t need to be strengthened, as the veto provided a backstop for government if it needed to protect internal discussions. Today’s ruling will lead to another period of reevaluation of FOI by government, and may well provoke attempts to provide more protection for government information. FOI campaigners and others will need to be vigilant.